Our own Leadbeater’s Possum has earned it’s place in National Geographic’s Photo Ark, taking the 7000th place in the ambitious photographic database. The Photo Ark is National Geographic photographer Joel Sartore’s effort to document the world’s endangered species as a way to inspire people to care about them and find innovative ways to save and protect their habitats. Sartore has visited 40 countries to create moving portraits of the animals involved in the Photo Ark. 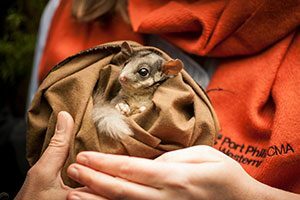 His goal is to document 12,000 species in the world’s zoos and wildlife sanctuaries and Victoria’s Leadbeater’s Possum had the honour of being his 7000th subject. The possum photographed was from at the Healesville Sanctuary. VVisit Joe Sartore’s website to view the images taken. Critically endangered and endemic to Victoria, the Leadbeater’s Possum exists only in Yellingbo Nature Conservation Reserve, the Mountain Ash forests of the Central Highlands and the Alpine Snow Gum forests between Lake Mountain and Mt Baw Baw. These tiny possums weigh only 100-165g. The small population at Yellingbo is a unique sub-species as it lives in low-lying Swamp Gum woodlands. It is estimated that there are less than 40 individuals of this sub-species left in the wild. What can you do to help the Leaderbeater’s Possum?